People walk in Downtown Evanston. The city’s “We’re Out Walking” program will begin its 11th year this Saturday. Evanston residents are lacing up their shoes for the 11th year in a row as the city gears up for its annual 12-week community fitness program. 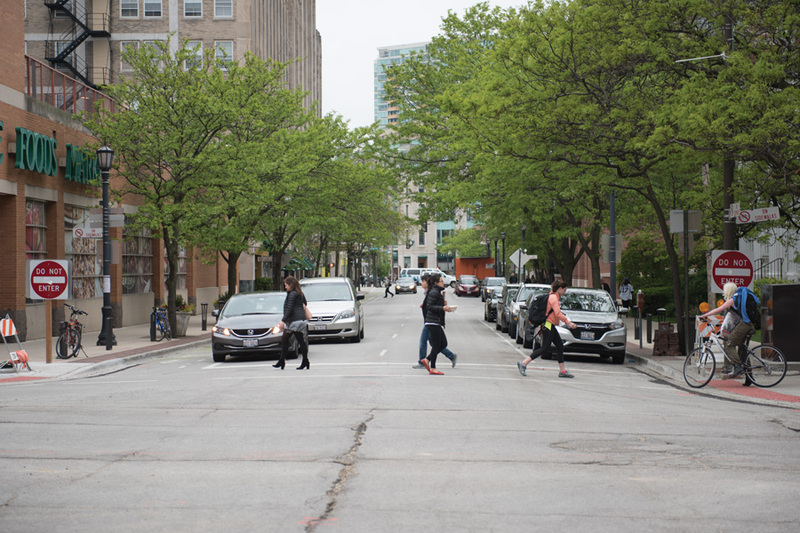 The program, called “We’re Out Walking,” is organized by Evanston’s Health and Human Services Department and runs for 12 weeks. The launch event will take place Saturday at Evanston Township High School, 1600 Dodge Ave., and will feature live fitness demonstrations, speeches from committee members and local Evanston vendors. “WOW is a combination of getting active, learning about wellness and meeting people you might not have otherwise met,” said Erin Fisher, Evanston’s public health educator and WOW program coordinator. Now entering its 11th year, WOW encourages community-wide engagement and physical activity, Fisher said. For a $5 fee, participants will have access to a wide variety of walks, fitness classes, seminars and more during the 12-week program, she said. Lynn Weiss, chair of WOW’s planning committee, said that by partnering with local Evanston businesses, WOW has made an effort to keep everything free or low cost — making it accessible to the widest range of people in Evanston. While WOW used to offer only two to three walks per week, the program has expanded, and will provide two to three per day this year, Fisher said. These walks are all led by volunteers, many of whom are seasoned WOW participants. Hilda Raisner, who has been participating in WOW for nearly a decade, has led a fair share of walks herself. This year, she is leading a 2.5 mile walk that will take place on Sunday mornings at 8 a.m. While the program was originally focused only on walking, Fisher said it has since expanded to offer a greater variety of fitness activities including Tai Chi, martial arts, yoga and Zumba. WOW started off as “Women Out Walking” — a health initiative to empower women in the community, Fisher said. After organizers wanted to be more inclusive, the program was renamed to “We’re Out Walking” last year. Weiss said the planning committee hopes to see WOW expand even more in the future. To keep participants motivated, there is an online system where they can enter their activities to win prizes donated by local Evanston businesses, Fisher said. She added that prizes will include massages, fitness classes and gift certificates. Correction: A previous version of this article misstated the number of years WOW has been running. The program is entering its 11th year. The Daily regrets the error.